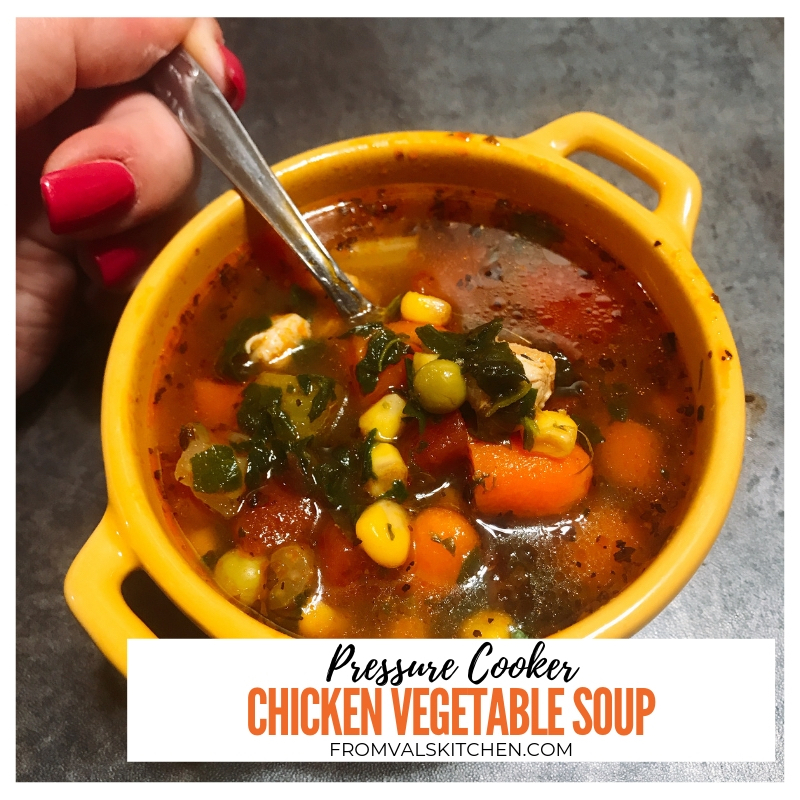 Pressure Cooker Chicken Vegetable Soup is a healthy, comforting meal perfect for warming up on a cold day or for eating when you’re feeling under the weather. This easy one-pot recipe is naturally gluten-free. 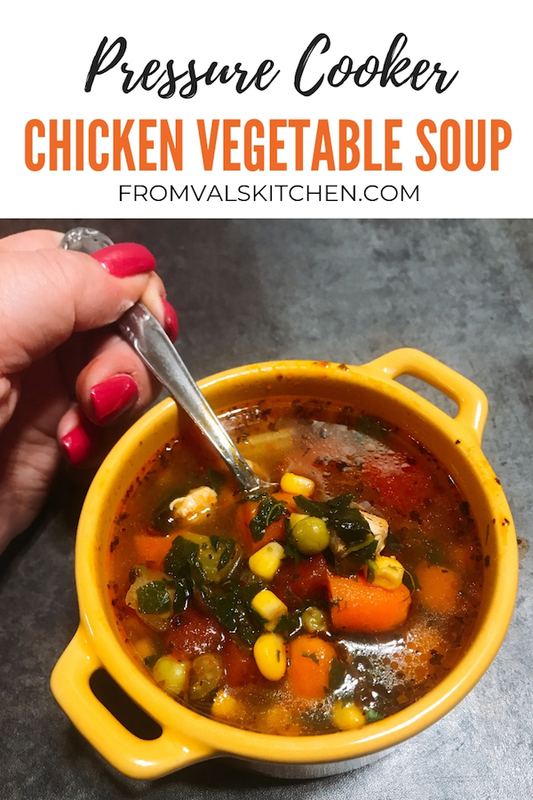 I was recently asked if I could share a recipe for pressure cooker vegetable soup, one that included some chicken. This was an easy challenge, and one that hubby enjoyed the results of tremendously because he loves vegetables. This soup recipe is easy to make and naturally gluten-free if you check your broth. It’s a reasonably healthy, comforting meal that’s equally perfect for warming up on a cold day or for eating when you’re feeling under the weather. 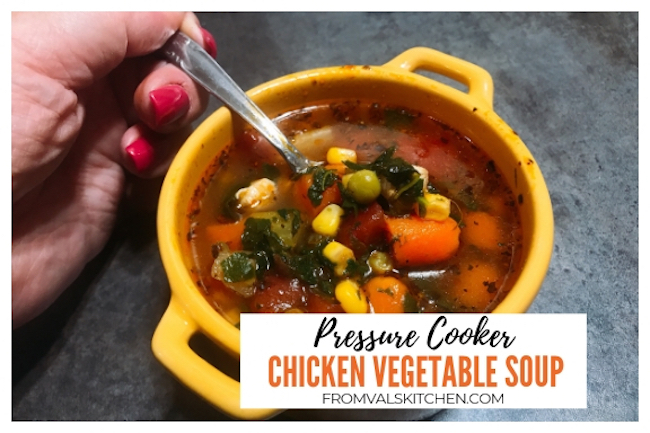 Here’s how I make Pressure Cooker Chicken Vegetable Soup. Place a thin layer of olive oil in the bottom of the pot. Place the cut onion, minced garlic and chicken to the pot and saute until the chicken is starting to turn white, stirring frequently. Add the cut potatoes, carrots, green beans, celery and parsley to the pot, followed by the frozen corn and peas. Pour the tomatoes and the chicken broth into the pot. Give the contents of the pot a good stir. Set the pressure cooker to cook for 3 minutes on manual high pressure. Once cooking time has finished, allow pressure to naturally release for 2 minutes then do a quick pressure release. Add the chopped spinach to the pot and stir well. Serve immediately with black pepper to taste. Place a thin layer of olive oil in the bottom of the pot. Place the cut onion, minced garlic and chicken to the pot and saute until the chicken is starting to turn white, stirring frequently. 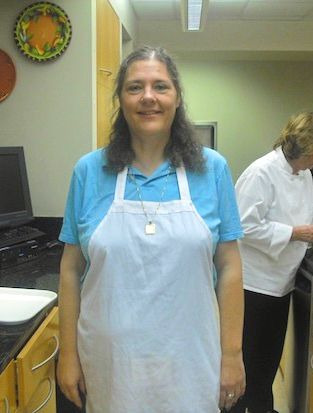 Add the cut potatoes, carrots, green beans, celery and parsley to the pot, followed by the frozen corn and peas. Pour the tomatoes and the chicken broth into the pot. Give the contents of the pot a good stir. Set the pressure cooker to cook for 3 minutes on manual high pressure. Once cooking time has finished, allow pressure to naturally release for 2 minutes then do a quick pressure release. Add the chopped spinach to the pot and stir well. Serve immediately with black pepper to taste. Yes, there’s a 1/2 white onion in there.